It was a final Saturday run-fest at Nunholm when a Dumfries U23 side hosted the Southern Steelers. With the sides contending with intermittent showers it was an amazing innings by Dumfries’s Marcus Richardson that lit up the second innings and the match. The Steelers set the ball rolling by amassing 234 for 5 from the allotted thirty overs in their high scoring first innings. Captain and opener Charlie Steel hit 44 at a run a ball. He was backed up by Noble with 39 and, in the later overs, by Faulkner with a rapid 43 and an even more rapid top score of 60 not out from Horn. Chris Brockwell was the pick of the bowlers with 4 wickets for just 26 on a day when everyone’s figures suffered. 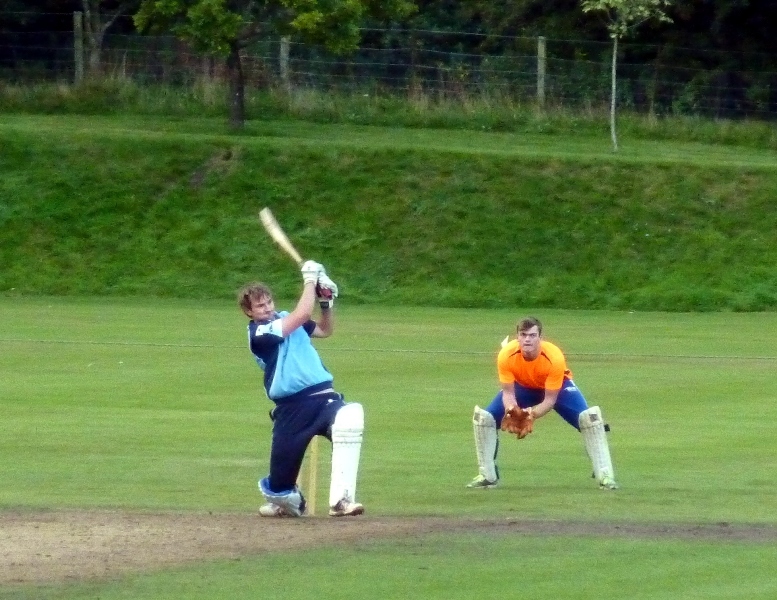 Dumfries set off on an unlikely run chase and it was number three Richardson that settled into the task. Along with youngster Chris McBride, who merely scored at a run a ball, the pair went past the two hundred by adding 192 for the second wicket when McBride was run out attempting an ambitious run for a fine innings of 46. However Richardson had sent the bowling to all parts as he hit 17 fours and 7 sixes. His century took just 57 balls as he hit a series of majestic shots. He had reached 135 in 79 deliveries when he followed McBride with the score still on 204, finally bowled by Jones. With six overs to go thirty runs were still needed but further wickets affected the run rate and it came down to ten to win off the last over. The Steelers held their nerve and won a great game of cricket by one just run. Dumfries finished on 233 for 7 and the Good Man Home Improvements Man of the Match for the Nunholm side was, unsurprisingly, Marcus Richardson.